Model EP-02 is Aircraft Propeller Trainer comprising a Hartzell threeblade propeller mounted on a free standing fixture. The trainer equipped with a constant speed, feathering and reverse pitch propeller. 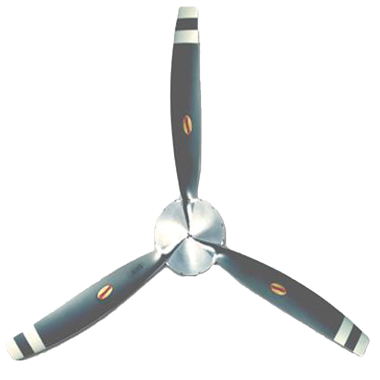 The range of propeller blade movement is demonstrated by the application of air pressure. The propellers are mounted on a moveable stand. The propeller trainer can be supplied with a high quality computer based training (CBT) courseware at an additional cost. The CBT covers the full scope of topics relevant to propellers, as taught in a typical aircraft maintenance training program, in detail with rich multimedia contents. The CBT may be used by students for self paced learning, and it may also be used by instructors to present high quality graphics and animations during the classroom lecture. The Model EP-02 Propeller Trainer in conjunction with Model EC-01 Propeller Cutaway provides a clear demonstration of aircraft propeller control and operation. AeroTrain welcomes customer suggestions for a customized training solution.